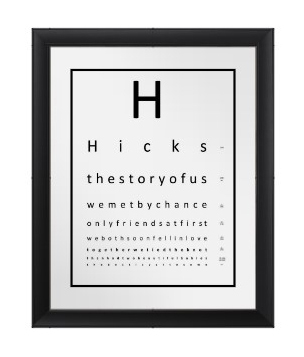 On the first day I started using Pinterest, I came across a template for a custom eye chart by The Cheese Thief and immediately wanted to make one for Mr. LH for our 13th wedding anniversary. The template is downloaded as a .doc file and with a little bit of patience (trying to figure out how it's formatted) you can create your own "story of us". You can even change the font, colors and borders if you want. Since I wasn't sure where this would hang once we moved, or what the room colors would be, I just made mine all black. I chose to do the 11x14 template and had it printed out on Zazzle on premium canvas (they had 50% off all posters at the time). I then picked up a large black frame at Michaels (with my 40% off coupon). I'm really pleased with the way this turned out! I especially like the dates running down the side. And to quote one of my friends, "That's awesome...and as you get older, you'll know when you need glasses, lol!" That's very cute! I love it!